Why Did Nephi Believe the Lord Would Prepare a Way? Lehi’s family had just traveled about 250 miles through what some travelers called a “brutal wilderness” with long stretches of nothing but barren desert, where “hardly a blade of grass breaks up the monotony.”1 The journey would have taken about 2 weeks.2 And now, they were being asked to go back to retrieve the plates of brass from a short-tempered Jerusalem official with command of a military garrison (1 Nephi 3:4, 31).3 If Laman and Lemuel were right about anything, it is that they were asked to do a “hard thing” (1 Nephi 3:5). This sets up the rest of the story about getting the plates, where the Lord’s commandments are central: command or commandment is repeated 18 times total in 1 Nephi 3 and 4.5 Affirming this, Nephi’s response that he will “go and do” is part of a chiasm—a literary pattern where key words, phrases, or ideas are repeated in reverse order.6 The center of a chiasm is usually the most important part, and Nephi’s chiasm has the Lord’s commandments at the very center. C save he shall prepare a way for them that they may accomplish the thing which he commandeth them. B And it came to pass that when my father had heard these words he was exceedingly glad, for he knew that I had been blessed of the Lord. Two types of commandments are at play in this story. First, the story teaches about specific commandments given in a particular time and context—like getting the plates from Laban. Second, it teaches about general commandments that apply to everyone, like “the commandments of the Lord” found on the plates of brass (1 Nephi 4:15). 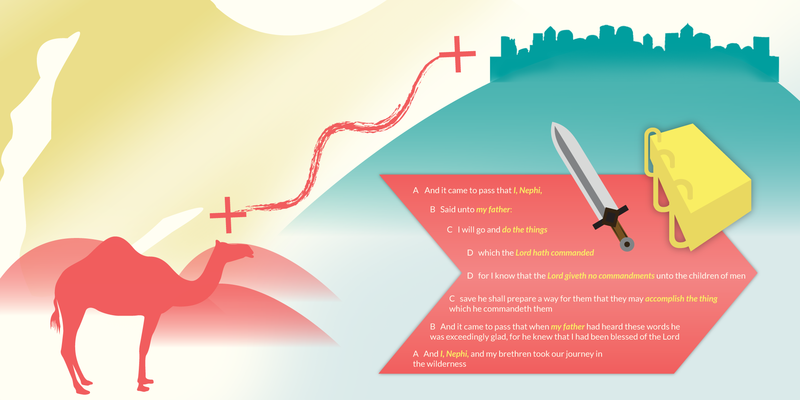 Nephi knew that the Lord would prepare a way for him because he trusted in Him, and he wrote the story about obtaining the plates to illustrate this truth. He placed the Lord’s commandments at the center of his response to his father, symbolizing their central importance to the whole story. President Thomas S. Monson, “Obedience Brings Blessings,” Ensign, May 2013, 89–92. President Henry B. Eyring, “Trust in God, Then Go and Do,” Ensign, November 2010, 70–73. Elder Richard G. Scott, “To Acquire Spiritual Guidance,” Ensign, November 2009, 6–9. 1. George Potter and Richard Wellington, Lehi in the Wilderness: 81 New, Documented Evidences That the Book of Mormon is a True History (Springville, UT: Cedar Fort, 2003), 22, 41. For the distance between Jerusalem and the camp at the Valley of Lemuel, see S. Kent Brown, Voices from the Dust: Book of Mormon Insights (American Fork, UT: Covenant Communications, 2004), 3, 6; S. Kent Brown, “New Light from Arabia on Lehi’s Trail,” in Echoes and Evidences of the Book of Mormon, ed. Donald W. Parry, Daniel C. Peterson, and John W. Welch (Provo, UT: FARMS, 2002), 55. 2. Brown, Voices from the Dust, 3. 3. Ancient records tell stories of military governors in ancient Near Eastern cities behaving much like Laban did. See Hugh Nibley, Approaching the Book of Mormon (Salt Lake City and Provo, UT: Deseret News and FARMS, 1988), 120–131. See also, Hugh Nibley, Lehi in the Desert/The World of the Jaredites/There Were Jaredites, The Collected Works of Hugh Nibley, Volume 5 (Salt Lake City and Provo, UT: Deseret Book and FARMS, 1988), 97–98. 4. Joseph Spencer, An Other Testament: On Typology, 2nd edition (Provo, UT: Neal A. Maxwell Institute for Religious Scholarship, 2016), 84–85. Spencer pointed out that this story really starts with the covenant made in 1 Nephi 2:19–24, and that Lehi and Nephi both repeat some form of the term command(ed/eth/ment) three times, but his analysis goes in a different direction than what will be followed here. 5. Spencer, An Other Testament, 84–90 discusses the centrality of commandment in the Laban story, though he takes a different approach than that followed here. On the frequency of command or commandment, see 1 Nephi 3:2, 4, 5, 7 (3x), 15, 16 (2x), 18, 21; 4:1, 11, 15, 17, 20, 34. 6. See Book of Mormon Central, “Why is the Presence of Chiasmus in the Book of Mormon Significant? (Mosiah 5:10–12),” KnoWhy 166 (August 16, 2016). See also, John W. Welch, “Chiasmus in the Book of Mormon,” BYU Studies 10, no. 3 (1969): 69–83; John W. Welch, “Chiasmus in the Book of Mormon,” in Chiasmus in Antiquity: Structures, Analyses, Exegesis, ed. John W. Welch (Hildesheim: Gerstenberg Verlag, 1981; reprint Provo, UT: Research Press, 1999), 198–210; John W. Welch, “Chiasmus in the Book of Mormon,” in Book of Mormon Authorship: New Light on Ancient Origins, ed. Noel B. Reynolds (Provo, UT: Religious Studies Center, 1982: reprint Provo, UT: FARMS, 1996), 33–52. 7. Adapted from Donald W. Parry, Poetic Parallelisms in the Book of Mormon: The Complete Text Reformatted (Provo, UT: Neal A. Maxwell Institute for Religious Scholarship, 2007), 5–6. 8. Spencer, An Other Testament, 88–90 pointes out the two different types of commandments at work in the story, but has a different approach to their relationship in the story. 9. Monte S. Nyman, Book of Mormon Commentary, 6 vol. (Orem, UT: Granite, 2003), 1:57; Joseph Fielding McConkie and Robert L. Millet, Doctrinal Commentary on the Book of Mormon, 4 vols. (Salt Lake City, UT: Deseret Book, 1987–1992), 1:40. 10. See John A. Tvedtnes, “He Shall Prepare Away,” in The Most Correct Book: Insights from a Book of Mormon Scholar (Salt Lake City, UT: Cornerstone Publishing, 1999), 104–109. 11. President Thomas S. Monson, “Obedience Brings Blessings,” Ensign, May 2013, 90. 12. See Brant A. Gardner, Second Witness: Analytical and Contextual Commentary on the Book of Mormon, 6 vols. (Salt Lake City, UT: Greg Kofford Books, 2007), 1:101–102. 13. President Henry B. Eyring, “Trust in God, Then Go and Do,” Ensign, November 2010, 71.